I am pleased to report that Sirius Inc was victorious in the last Pic Tok election cycle! Despite persistent allegations of electoral fraud, by the ousted faction, there is no major opposition to our expansion. The political disunity of the Pic Tok League was their undoing. Sirius Inc now controls Lobachevsky Outpost, and will begin anti-piracy sweeps after local defense assets are fully integrated. The benefits of Sirius living have been extended to yet another world. Please stay tuned for local trade & security advisories. 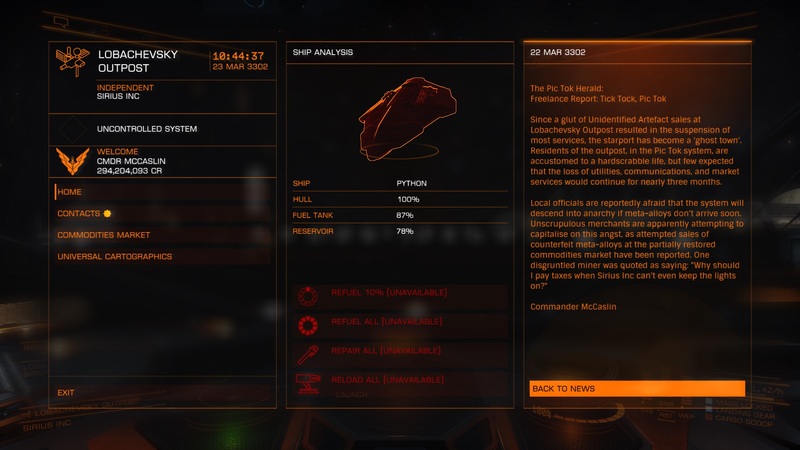 UPDATE: Despite best efforts to police our (recently incorporated) system of Pic Tok, a recent expansion by HIP 16591 Holdings into PT has upset the local balance of power. There are widespread accusations of sabotage, terrorism, and even "xenophilia". Two conflicts are now raging... the loss of armament services (a result of UA-trafficking) could delay our response. UPDATE: The internecine conflicts which plague this system have (temporarily) ground to a halt... along with most vital services. I originally suspected trade unionists (of the Pic Tok League) were conducting a labor strike, but now the cause is manifestly clear: UA Malfunctions. Each faction seeks to blame their rival (or rivals), but SINC intelligence suggests that none are blameless. 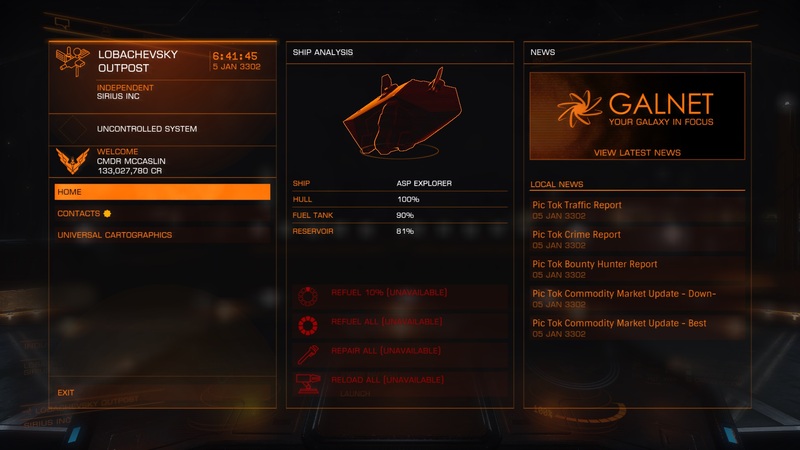 UPDATE: I arrived in PT not long ago, with 35t of meta-alloys (recently harvested from Merope 5c). It was my hope, if not my firm belief, that SINC technicians could put this material to productive use. Unfortunately, UA malfunctions have pushed Lobachevsky Outpost into a nearly catatonic state. The local commodities market, and attendant machinery, are non-functioning. Essential cargo must be carried (from ship to station) by our dedicated support staff. We are unable to replicate the (apparent) success of Obsidian Orbital at this time. 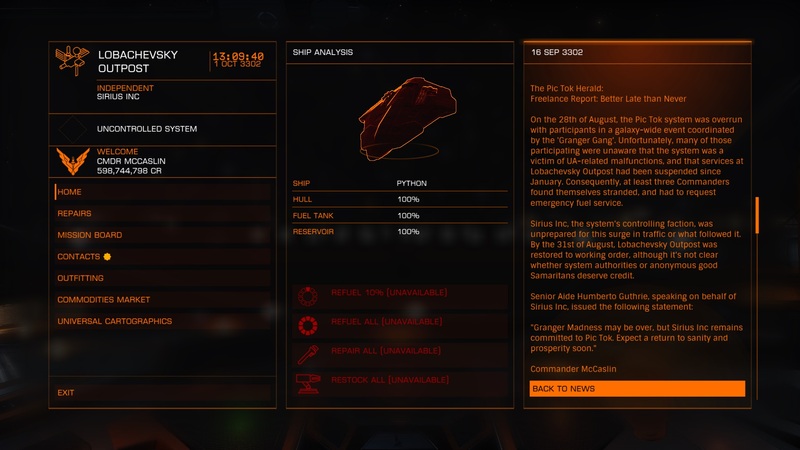 Since a glut of Unidentified Artefact sales at Lobachevsky Outpost resulted in the suspension of most services, the starport has become a 'ghost town'. Residents of the outpost, in the Pic Tok system, are accustomed to a hardscrabble life, but few expected that the loss of utilities, communications, and market services would continue for nearly three months. Local officials are reportedly afraid that the system will descend into anarchy if meta-alloys don't arrive soon. Unscrupulous merchants are apparently attempting to capitalise on this angst, as attempted sales of counterfeit meta-alloys at the partially restored commodities market have been reported. One disgruntled miner was quoted as saying: "Why should I pay taxes when Sirius Inc can't even keep the lights on?" On the 28th of August, the Pic Tok system was overrun with participants in a galaxy-wide event coordinated by the 'Granger Gang'. Unfortunately, many of those participating were unaware that the system was a victim of UA-related malfunctions, and that services at Lobachevsky Outpost had been suspended since January. Consequently, at least three Commanders found themselves stranded, and had to request emergency fuel service. Sirius Inc, the system's controlling faction, were unprepared for this traffic surge or what followed it. By the 31st of August, Lobachevsky Outpost was restored to working order, although it's not clear whether local authorities or anonymous good Samaritans deserve credit. "Granger Madness may be over, but Sirius Inc remains committed to Pic Tok. Expect a return to sanity and prosperity soon". Protestors in Pic Tok are demanding the removal of a mysterious listening post. The failure of Sirius Inc. to explain its presence is a central theme. Similar complaints echo in the corridors of Lobachevsky Port. 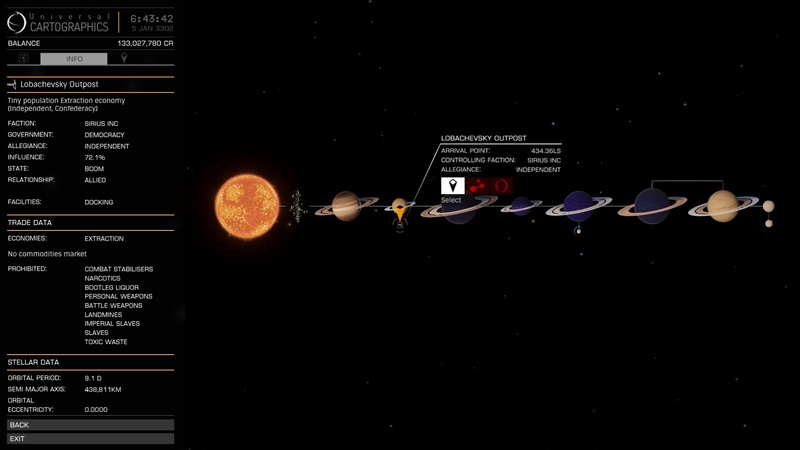 Signal data from the listening post points to an abandoned mining outpost on planet A 5 of Hyades Sector DR-V C2-23, and the outpost draws curious Commanders to the system every day.